Two IAF raids reported on Wednesday and Friday targeted Hezbollah arms convoys. At least one person reported killed. Syrian and Lebanese media are reporting at least two IAF raids that struck targets in Western Syria, but there is still confusion regarding when they took place and what targets were hit. According to Channel 2's website, “unofficial media” in Syria and Lebanon said there were two attacks – the second one on Friday, against Hezbollah trucks that carried surface-to-surface missiles. Photographs that were published showed the remains of the bombed targets. Another Hezbollah convoy was struck Wednesday at al-Qalamoun and at least one person was killed in that attack, according to Al Arabiya. Al-Qalamoun is located near the region bordering Lebanon. According to Lebanese television station LBC, the targets were centers and mobile forces from Brigades 65, 155 and 192 of the Syrian Army, which possess heavy missiles that were meant for Hezbollah, the Shiite Lebanese militia that is a proxy of Iran.. The IAF raid at al-Qalamoun hit a missile depot in the strategic western Syrian region, Al Arabiya News’ sister channel Al Hadath reported Thursday. Sources also told Al Hadath that two other IAF strikes on Wednesday had targeted a convoy carrying arms belonging to, or meant for, Hezbollah. The sources reported several explosions at Al-Qutayfah, Yabroud and Qarah, on the outskirts of Damascus. The IDF said in response to the reports that it does not comment on reports from foreign sources. 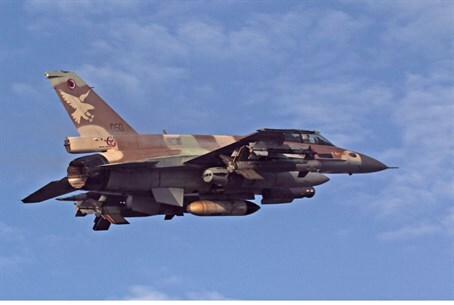 On April 4, Arab news sources reported that an unidentified jet believed to be Israeli destroyed warehouses in southern Libya that held weapons bought by Iran for Hamas. According to the reports in Al Watan and other news outlets, the warehouses were completely destroyed. The weapons that were inside them had allegedly been purchased by Iran, by means of weapons dealers in Sudan and Chad, and were supposed to be smuggled to Hamas through Egypt, by means of the smuggling tunnels between Sinai and Gaza. The destruction of the weapons stores in southern Libya was carried out in coordination with the Egyptian security and intelligence apparatuses, the reports claimed. Al Watan added that Egypt allowed the Israeli jet to pass through its airspace en route to southern Libya. On January 18, a reported IAF strike killed Jihad Mughniyeh, the son of Imad Mughniyeh, who was one of the personal bodyguards of Hezbollah's top terrorist Hassan Nasrallah. A vehicle that Mughniyeh and his fellow Hezbollah terrorists were riding in had entered the Syrian side of the Golan from Lebanon. Also killed in the strike was an Iranian general.